Philippians 2:12b-13, …work out your own salvation with fear and trembling; 13 for it is God who works in you both to will and to do for His good pleasure. God is too good for us to experience His love and then be content to abuse that love. We should be so very afraid of getting it wrong, that we are absolutely sure we are getting it right, to the point that we go out of our way to live pleasing to Him. As I said last week, “Accepting the rejected is not the weakness of the gospel; it is its strength!” Paul said, “For when I am weak, I am strong” There is a great deal of difference between the cold callousness of a rebellious heart and the deeply troubled heart of a transforming Christian whose whispered prayer is, “God, save me from myself.” It is to the conflicted heart that seeks so desperately for a place of refuge that God extends a loving hand and tender words… so, No, He cannot shelter hardened criminals who are content to live as outlaws from the Word of the Lord. The Christian believes in all the truth of the Bible, not just some of its truths. Yes, He has grace, but He does not compromise truth. Some may say, how can you defended the Church, with its rising divorce rate and afflicted leadership? Doesn’t the Church need to bathe itself in its own message? Yes, it does. We have strengths and struggles. We have conflicts and conquests; and face challenges. We are not a finished product. 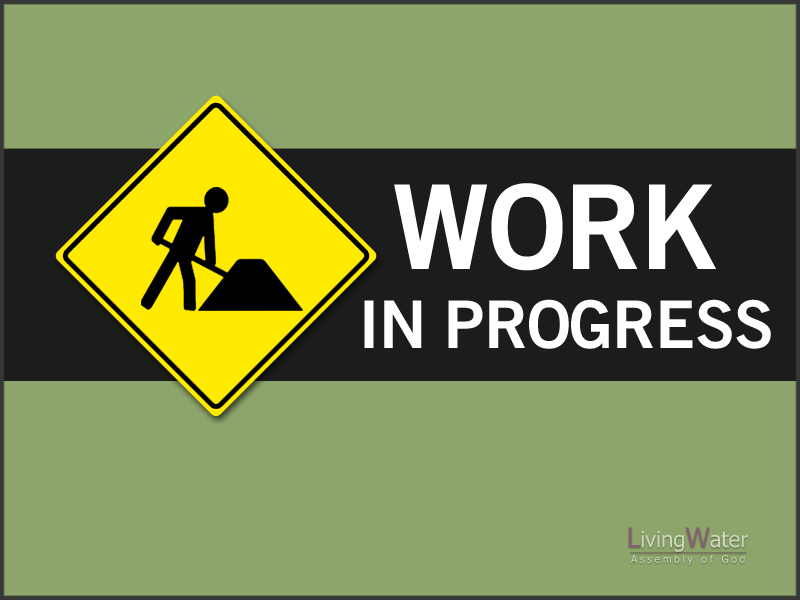 We are a “work in progress.” This not an excuse! And, this “dippity-doo, a little dab will do ya” mentality that is being preached today is not scriptural at all. We need more. More of His holiness, more grace that empowers us, and transforms us to be different then this world, to be an image of God and Heaven on earth. Beneath the streaming tears of a grateful heart, through our trembling lips , must emerge the thought that Christ has done it all, and that we have nothing to boast in but His precious blood—His blood alone! Ephesians 5:1, Therefore be imitators of God as dear children. We need treatment every day. I sometimes feel like God is slow in His deliverance, like the Apostle Paul, I just want some thoughts and desires gone, my throne removed. I struggle in my heart sometimes to understand why God does not more readily answered my requests, I have some verse that I would like share with you today that may help us. Genesis 8:1, Then God remembered Noah, and every living thing, and all the animals that were with him in the ark. And God made a wind to pass over the earth, and the waters subsided. The first four words are all we needed. When we realize that God knows where we are and that He will get there in time—what peace, what joy! Before Noah ran out of resources and provisions, God remembered him! It rain forty days and forty nights, but Noah was on the boat for about a year, before they found land. The Lord knows where you and I are, and He knows how much we have left in reserved. Just before we run out, God will send the wind to blow back the waters of impossibility and proved for us. What ammunition we can receive out of those four powerful words: Then God remembered Noah! We all need the ministry of God’s Word to keep our attitude from falling while we wait on the manifestation of the promise of God. Sometimes very simplistic reminders that God is still in control brings great joy to the heart of someone who is in a holding pattern. The comforting Spirit of God calms our fears every time He reminds us that God doesn’t forget. Hebrews 6:10 (NLT), For God is not unjust. He will not forget how hard you have worked for Him and how you have shown your love to Him by caring for other believers, as you still do. God hedges in His own that He may preserve them, but oftentimes we only see the wrong side of the hedge, and so misunderstand His dealings. 2 Corinthians 12:8-10, Concerning this thing I pleaded with the Lord three times that it might depart from me. 9 And He said to me, “My grace is sufficient for you, for My strength is made perfect in weakness.” Therefore most gladly I will rather boast in my infirmities, that the power of Christ may rest upon me. James said, James 1:2-5, My brethren, count it all joy when you fall into various trials, knowing that the testing of your faith produces patience. But let patience have its perfect work, that you may be perfect and complete, lacking nothing. If any of you lacks wisdom, let him ask of God, who gives to all liberally and without reproach, and it will be given to him.